Chick Gandil: You go back to Boston and turn seventy grand at the drop of a hat? I find that hard to believe. Sport Sullivan: You say you can find seven men on the best club that ever took the field willin' to throw the World Series? I find that hard to believe. Chick Gandil: You never played for Charlie Comiskey. 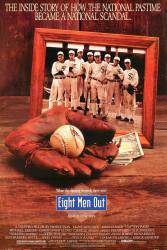 The film is based on the real-life events of the 1919 Black Sox scandal, in which members of the Chicago White Sox were charged with "throwing" the World Series (i.e. losing on purpose). Even though many people believe he wasn't involved, "Shoeless" Joe Jackson was banned from baseball and hasn't been inducted into the Baseball Hall of Fame because of that.